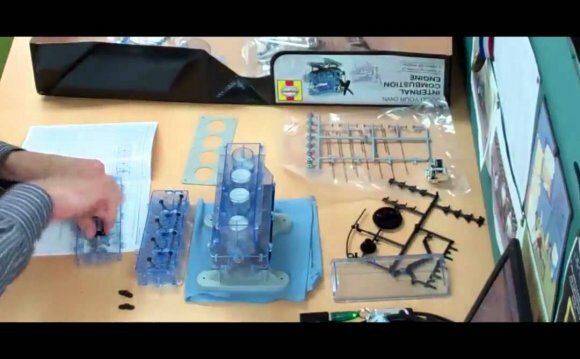 This model engine is designed to be fun to put together, and to make it easier for you to understand how a full-size four-stroke car engine works. To keep things simple this engine does not include; oil filter, cooling system, air filter, connecting rod bearings, piston rings, oil pump, alternator and starter (a drive module powered by a small electric motor is fitted in place of the starter motor). All parts screw or clip together, so the engine can be taken apart and rebuilt. An electric motor drives the engine and requires two AA batteries (not included). Kit includes: gudgeon pins, connecting rods with bearing caps, piston halves, crankshaft parts, sump pan, all cylinder parts and valve parts, engine stand, timing belt and parts, water pump, fan belt and pulley, flywheel, clutch cover, throttle body, inlet manifold, exhause manifold, dip stick, cams, washers, rocker shaft and parts, cam shaft, valve springs, distributor, electric motor unit, battery box and all screw and a screw driver to use to assemble all parts.